As the Ibiza season draws to a close and reunion parties pop up across the UK, EGG London is taking care of those early winter blues with a special Ibiza workers reunion party on 10 October. 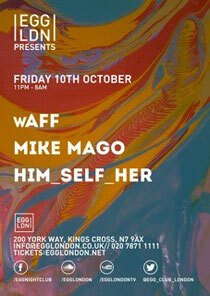 Headlining the party are wAFF, Mike Mago and Him_Self_Her. After impressing so much on New Year’s Eve, wAFF is back once again to the London club. Still in his early-20s and having been picked out as one to watch by DJ Mag at the start of 2013, wAFF is still very much in the ascendency with several releases on Hot Creations already under his belt and many more still to come. He also has tracks due out on Sven Vath’s Cocoon label. Also on the line-up is Michiel Thomassen, professionally known as Mike Mago, who as label head honcho of Amsterdam-based BMKLTSCH RCRDS has been curating cool releases from Dutch soil and beyond for several years now. He’s also had releases on labels like Ministry of Sound and support from guys like Toolroom Records’ Mark Knight. Him_self_her are a house act who’ve received support from the likes of Pete Tong, Jamie Jones, Hot Since 82, Solomun, H.O.S.H, Lee Foss, and Sandy Rivera. 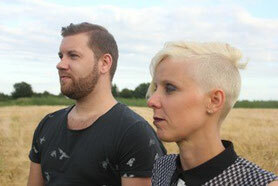 Signed to Damian Lazarus’ Crosstown Rebels label, the production duo from Leicester are creating a bit of a buzz. Perhaps best known for their release ‘Gone Too Long’ on Cream Couture records in 2012, the track spent 11 weeks at No 1 in the Beatport New Disco chart, and seven months in the top 10.